Looking for that perfect Christmas gift for that whisky connoisseur in your life? How about ‘The Luxury Collection’ from The Whisky Shop. The Luxury Collection consists of three, rare and high value whiskies. The retail price of the three whiskies range from £600 to £26,500. Take a look at the three options below. – The Dalmore 25 forms part of The Dalmore Principal Collection and only 3000 bottles are available globally each year. – During a quarter century of patient aging, this whisky passes through a range of cask types, creating wonderful depth and complexity of flavour. – Initially matured in American white oak barrels, the whisky is then transferred for a further aging period in a combination of Palomino Fino sherry butts and first-fill Bourbon barrels. Each batch is then mixed and rested, or “married” in Bourbon barrels before being transferred into Tawny Port casks, known as “pipes”, from Portugal for a final, delicate finishing period. With layer upon layer of flavour, coming from the various casks used in the maturation process, this is a voluptuous whisky. Definitely one for after dinner, notes of rich dried fruit, orange peel, spiced gingerbread, marzipan and chocolate truffles make it a perfect Christmas dram. – Created from just two casks, one from 1955 and one from 1957, only 500 individually numbered bottles of this incredibly rare and precious whisky will ever be produced, with just 50 being released each year since 2009. – The elegant presentation is fitting for a whisky of such rarity. Each bottle is hand-blown by independent Scottish glass studio, Glasstorm, dressed with a heavyweight stopper, neck collar and label plaque fashioned from Scottish silver by sixth-generation silversmith Thomas Fattorini, and finished with a numbered wax cartouche. – The hand-stitched black leather case was inspired by one of William Grant’s original ledgers and is lined with bespoke hand-woven silk to perfectly complement this stunning bottle. The Glenfiddich 50 year old is wonderfully fresh despite over half a century in oak casks. With a pale, golden hue, the whisky is strikingly fruity and floral – a real surprise in a whisky of this age. Orange marmalade and vanilla fudge come through, along with a delicate hint of smoke like a whisper from an older era of Speyside whisky-making. – The Balvenie is steeped in a rich tradition of handcrafted whisky and the latest release of The Balvenie 50 is the pinnacle of this craft. – David Stewart, The Balvenie Malt Master, and one of the whisky industry’s longest-serving master blenders, has selected two European oak hogshead casks, both of which were filled on the same day in May 1963 and left to rest in Warehouse 24 at The Balvenie distillery. – Rather than marrying the whisky from each cask, they have been bottled separately to create a magnificent pair of single cask bottlings, offering connoisseurs the chance to explore the uniquely complex characteristics imparted by each cask. 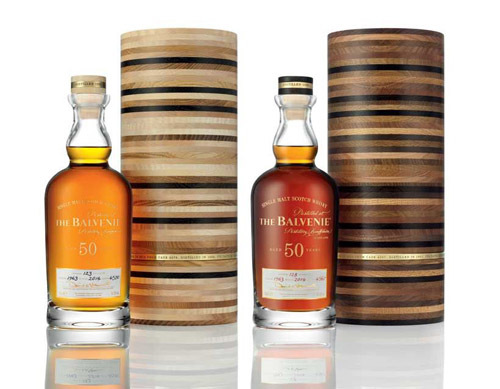 – In keeping with the traditions of The Balvenie, the bottles are presented in stunning handcrafted wooden cases comprising 49 layers of wood and a single brass layer. Cask 4567 produced 131 bottles, and with only 128 bottles coming from cask 4570, not everyone will be able to secure a pair. The Balvenie 50 year old Cask 4567, 45.4% – a beautiful, deep reddish colour, the whisky has sumptuously rich aromas and flavours of dark fruits and Christmas spices, typical of a European oak maturation. The Balvenie 50 year old Cask 4570, 45.9% – by contrast, this has a rich golden hue and a surprisingly light and elegant oakiness, underpinned by some of the characteristic vanilla and honey sweetness of The Balvenie.